When E. Michael Murphy was 16 years old he began volunteering in a local hospital—taking patients to their cars by wheelchair when it was time for them to be discharged. During that same time in high school, he was taking chemistry and found a deep passion for it. He soon learned that he could be in a profession that combined his two passions: patient care and chemistry. When did you kow you wanted to be a pharmacist? I knew I wanted to be a pharmacist when I was 16 in large part because of my grandfather. When he passed away in 2008 I started learning more about his career. He had served Cleveland, OH as a community pharmacist for nearly 50 years. I’ll always remember being at his funeral and seeing the outpouring of love from a community that had been impacted by his care. I knew that I wanted to make as big of a difference in my community as he had. I’ve always been a Buckeye. It’s the heart of a city that I love so much and a place that has always felt like home. 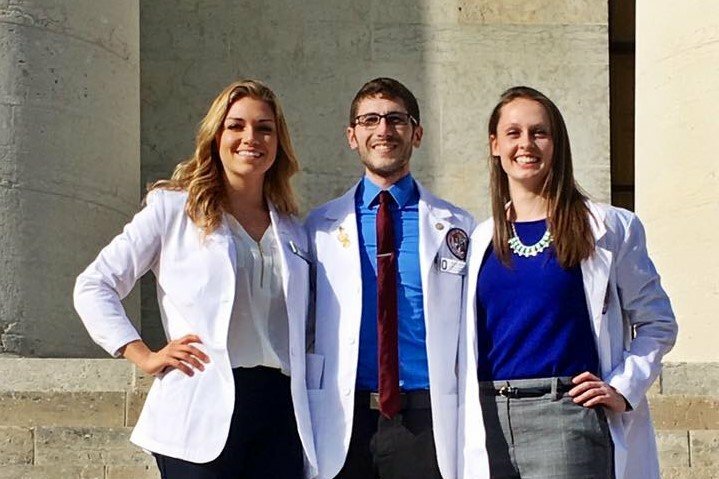 With the endless opportunities available at the Wexner Medical Center, and James Comprehensive Cancer Hospital, and faculty that are leaders in the profession, I knew that The Ohio State University was a perfect fit for me. What I love most about pharmacy school is the community I have found within the American Pharmacists Association (APhA). This organization is made up of leaders in the profession that stretch across our country. Each individual’s uniqueness makes APhA special. Our collective voice makes us strong. Has anyone helped guide you to where you are now? How did they help? No one has gotten where they are alone. If I have achieved anything in my life it is in large part due to my mentors, family, and friends. They have provided me with advice and supported me in my aspirations. The person who has helped me the most to get me to where I am today is my wife, Robin. The intensity of her love and support has given me the confidence to reach for the stars. Do the little things well and the big things will be easy. What advice would you give someone in high school? You are brilliant and strong. There might be challenging moments along your journey to becoming a pharmacist but you will overcome them and come out stronger. Look in your heart and find what you are truly passionate about and follow that inner voice. If you listen, you will go on to make the lives around you happier and healthier.